I’m really excited to be a Guest Participant again in the One Room Challenge! This is a great way to get inspiration and motivation for your home. This spring, I re-decorated our boys’ bathroom. For this fall’s challenge, I’m transforming our teen’s bedroom. His new space is inspired by an industrial loft, with an exposed brick wall and other great features! Thanks for following along! This week, I’m so excited to show you the lighting projects for this space. These are both moderately easy DIYs, and that’s exactly what I need right now with everything else going on at home and work! TOTALLY in love with this project. More details, including materials and instructions, in this post. For now, just enjoy the pictures! This is actually one of the first projects I did, when I started blogging. The detailed instructions are in the original post. This room used to be my craft room, so I gave myself some license to use more feminine touches. Kai’s not picky, but I did want to update this lamp for him. I originally thought I might be able to just change the shade, but it was fixed in place. While changing out the light bulbs, I realized that the room looked a lot brighter – and the light looked a bit less feminine – without the bottom glass and finial, so I left it that way for a little update. Here’s an earlier before-and-after of the light. And here’s how it looks without the bottom finial and with some fun Edison-style bulbs inside. A huge thank you to Linda for creating the One Room Challenge community, and high fives to all my fellow bloggers whose hard work and creativity were great inspirations! Be sure to go back to the One Room Challenge page to check out all the other projects! Whether you lean towards Scandinavian-inspired, Modern Farmhouse, or California Casual, everything light, white, and wood is in right now – and I love it! 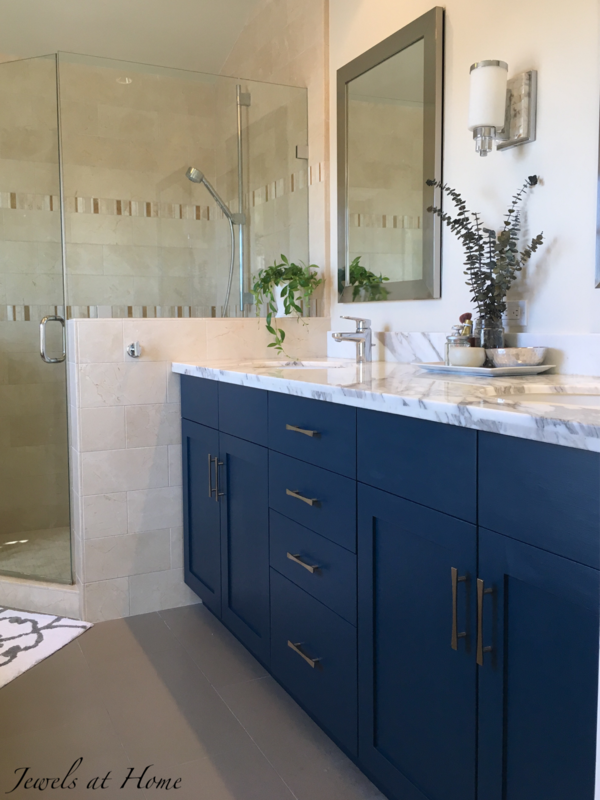 While I’m always excited to incorporate new looks into my home, it takes some creativity to do this – we’ve had most of our major furniture pieces for a decade or more. One strategy that’s easy on the budget and environment is to change out accessories like pillows. Here are some light and bright ideas that you can use to give your room a new look! Admittedly, my “things I have in the house already” is rather extensive, but I’m still proud that I managed to make all these pillows with them. 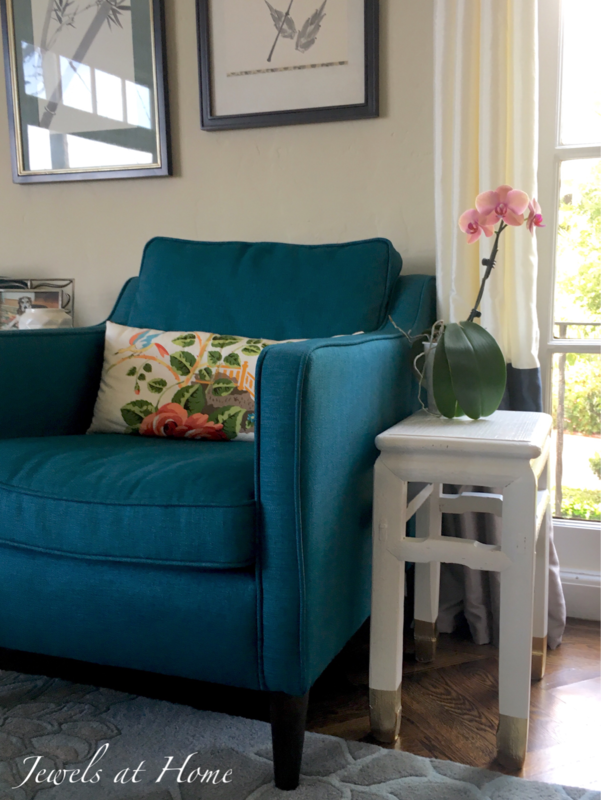 Here are the links to a tutorial on making simple throw pillows and tutorials for the window seat pillows, including bolster and flanged pillows. There are a million more ideas for sewing simple pillows to change the look of your space – and when I try them all, you’ll see it here! This is a great idea for a compact DIY headboard you can use in a small space – or anywhere you want! This idea first caught my eye when Emily Henderson featured Shwa Style’s version of this pillow headboard. A Pair and a Spare DIY also has a lovely version of this idea. And now, for my own take on this easy and stylishly funky headboard! When I first created our tween boy’s room a few years ago, I made a DIY bed from Ikea bookcases, and the headboard was an Ikea floating shelf mounted on its side. These days, this room is home to different tween boy, and it was time for a cozy upgrade to his bed! I was thinking of buying leather straps for this project, but when I was at the Flea Market with my friend Ariana of Act 2 Decor, I saw these vintage belts and loved the idea of doing a twist on this project! Upholstered headboards are really popular, but there’s part of me that just isn’t quite sure how to keep a fabric headboard clean. If you’re with me, then you should like this project, and you should also check out the washable quilted headboard slipcovers I made for our master bedroom in grey velvet and navy velvet! Our tween loves to read in bed, and he is really enjoying the comfy new addition to his bedroom! 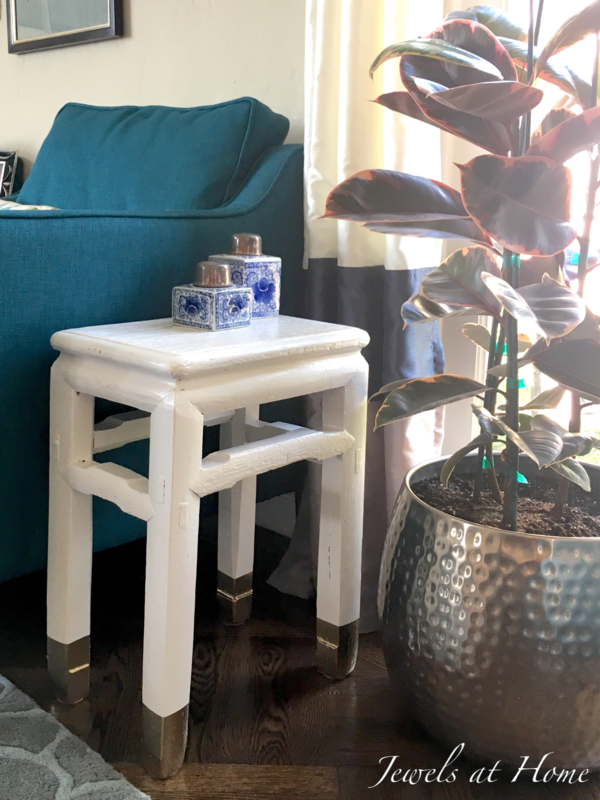 DIY Mid-Century Modern Plant Stands – Props to Plants! Easy Tile Makeover – The Great Cover-up! Our powder room is really tiny. And it was really plain when we moved in to our house a few years ago. I spruced up the space a few years ago, and I’ve been pretty happy with it, but the one last part that I still kind of hated was the pink floor tile. Now, I can finally say I love every part of this room! 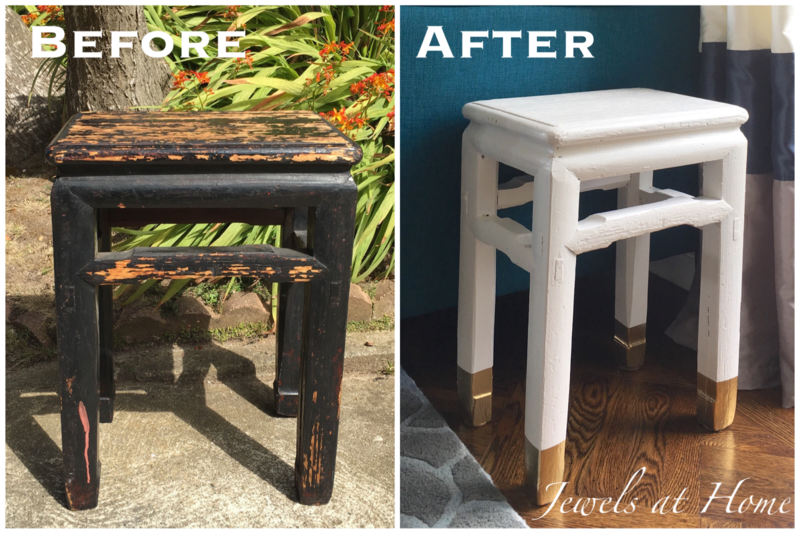 The secret ingredient for this mini-makeover is vinyl tile decals! They come in many patterns and sizes, and most of the vendors will even help you with custom sizes, which is what I ordered. I chose this Moroccan-inspired pattern that is so popular right now. It’s very similar to the tile I used for my DIY tile table runner. I painted my grout first, to cover the pink, and the decals are very easy to apply – they are repositionable and a nice weight and quality. I was afraid vinyl would be too cheap-y, but it turns out that they add function as well as form, because the floor is not as cold underfoot. I’m sure they won’t last forever, but I feel like this little change will really help hold us over until a real renovation some day. Finn came to hang out with me and check out the new smells… I mean floor. Also, I am so in love with my new blue Rothy’s shoes. If you want to check out a pair, here’s a $20 discount code! 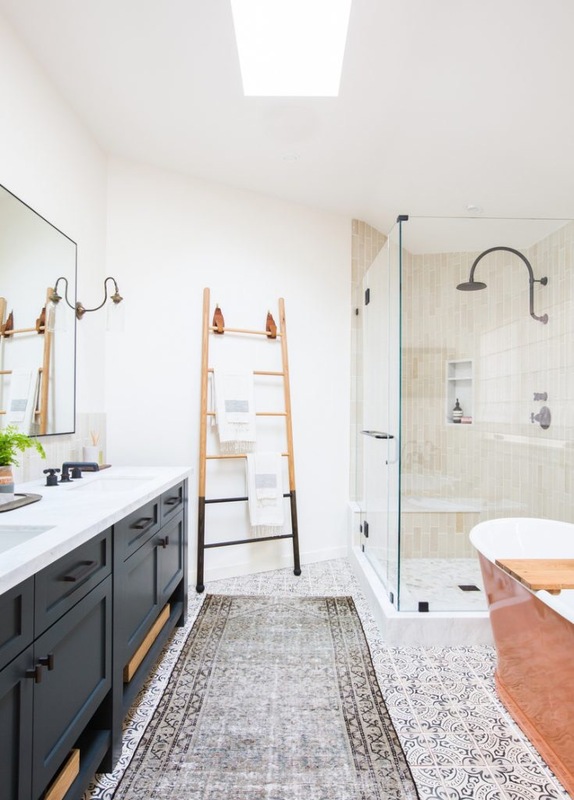 Where will you try a tile makeover? I’m decorating our foyer and wanted to feature a beautiful console table. 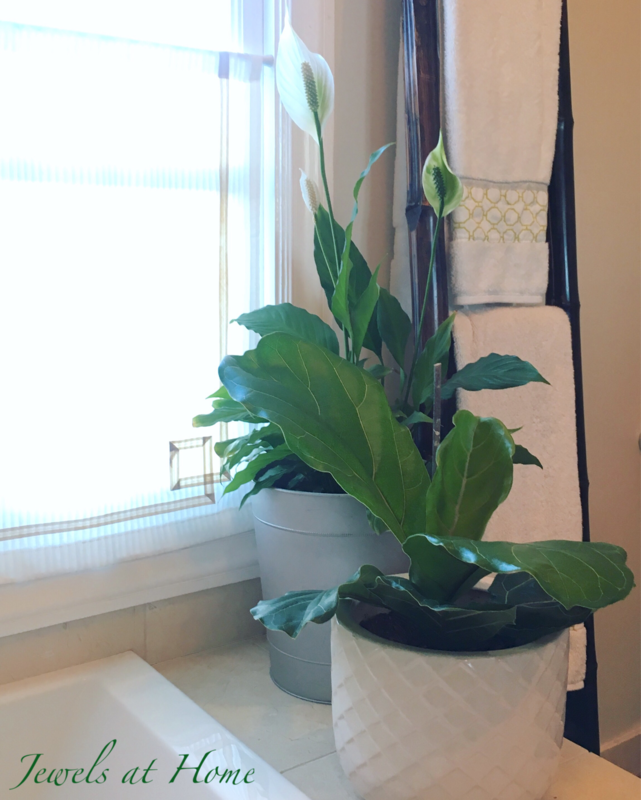 While I found some already-finished options I liked, I needed something very specific to help disguise a radiator – but not block it off – so I decided to dive in and customize my own! I knew I wanted the feel of a lacquered Chinese table, but I couldn’t find one in the right size and shape. I looked for something else with simple lines and hoped that with a few tweaks, some paint, and new hardware, I could pull off a transformation! I started by assembling the sideboard except for the lower shelf. I wanted to leave the bottom open for baskets or stools. I had to fill in a few holes with wood filler. I also filled in the holes for the hardware and drilled new ones to match handles I bought on Etsy. After sanding for a smooth finish, I started painting. I really debated the color choice, because the hall is already quite dark. In the end, I just knew I had to go with the color I loved and (with credit to Tim Gunn on Project Runway) make it work! 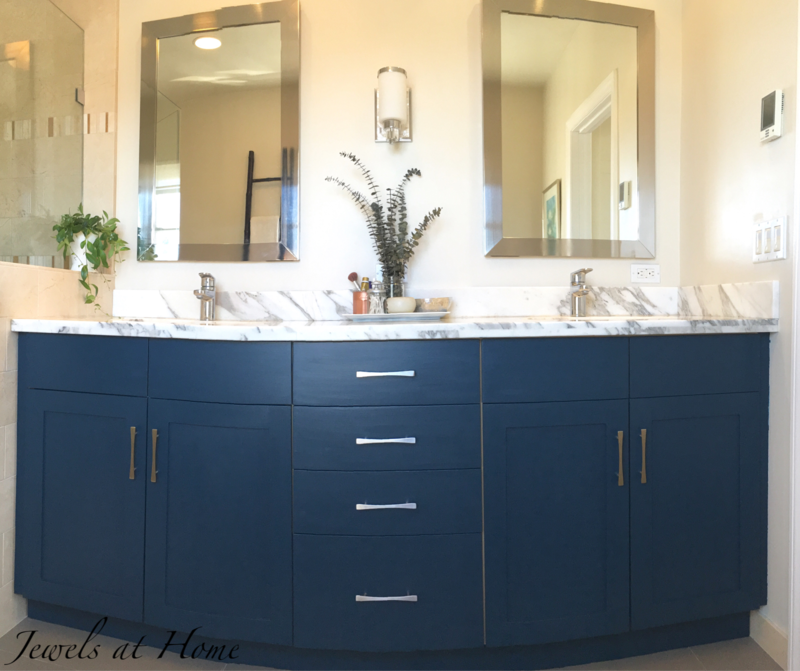 The navy paint is Nocturne by Behr, which I also used to repaint our master bath vanity. After painting, I added several coats of a glossy varnish, both to create shine as well as protect the finish. My plan is to use some light-colored and neutral accessories to balance out the darker table. Finn, the rug model, and the new console. Can’t wait to see the whole space put together! 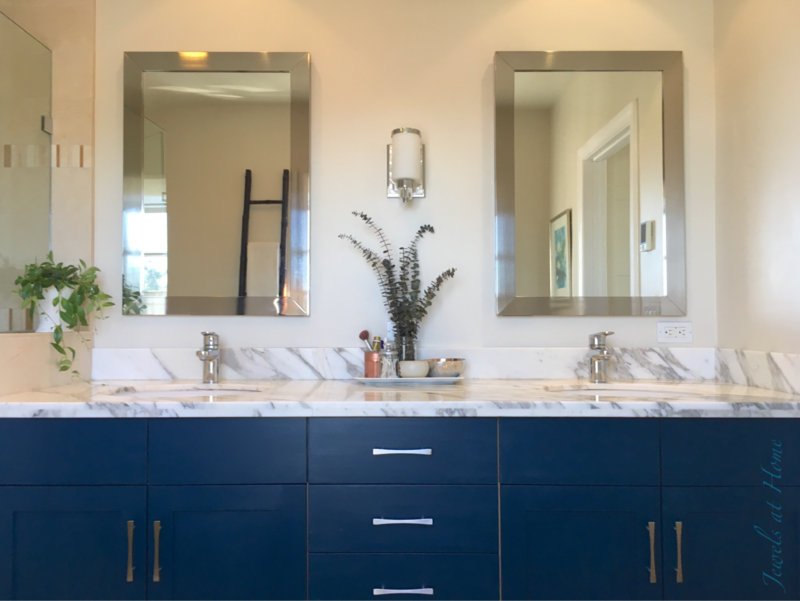 The main change I made to our bathroom was painting the vanity. The color is Nocturne by Behr from Home Depot. 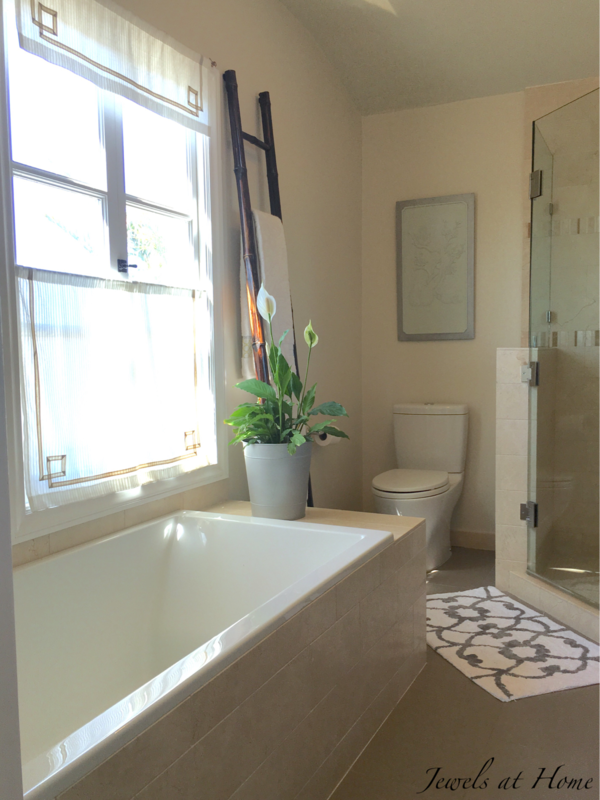 The smaller changes I made were a new bathmat and rearranging the accessories. 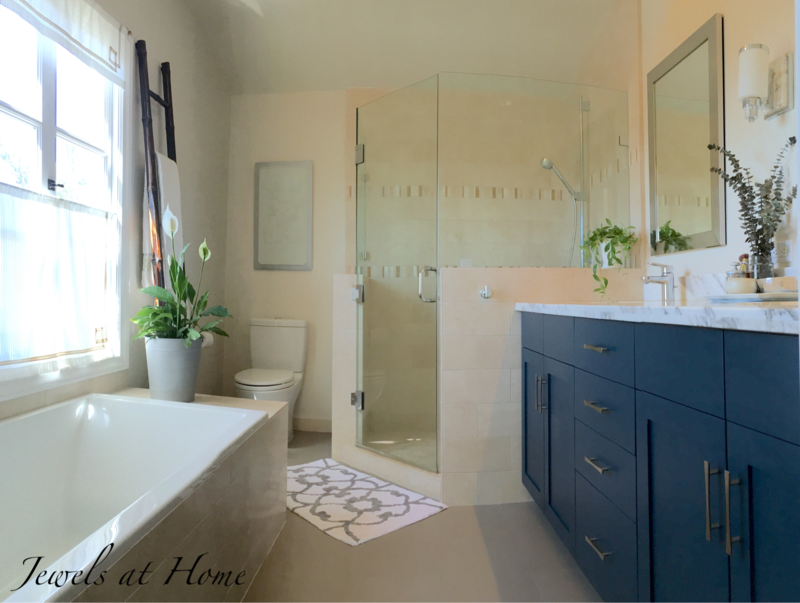 My inspiration was a stunning master bath by Amber Interiors. If you are as in love as I am with her style, check out my post on finding the ingredients for her beautiful spaces. 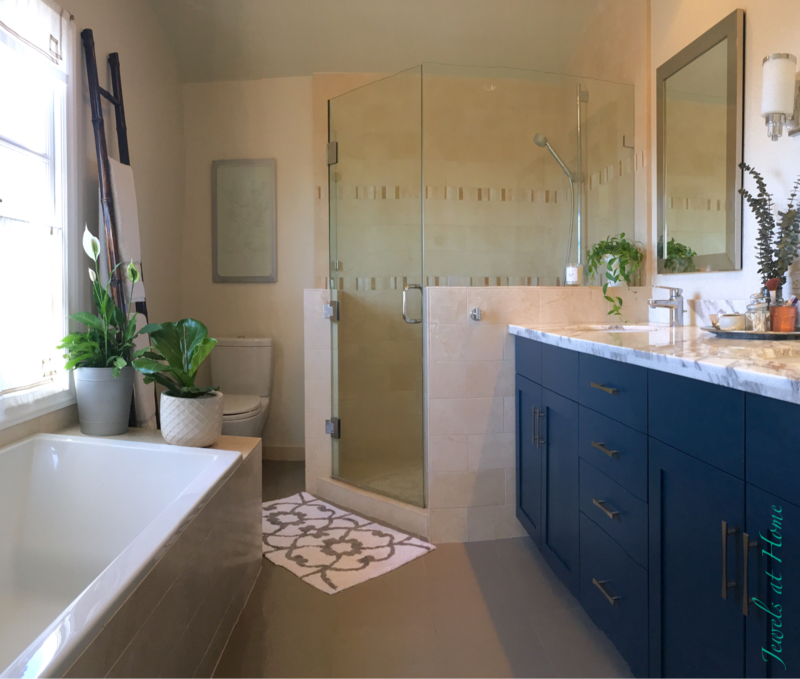 With just a few changes, I am excited to see the transformation in our master bathroom! I wonder which room is next to be the beneficiary (victim) of my makeover fever! You may know that doing the Avon 39 Walk for Breast Cancer is an annual tradition for me. The two-day walk gives lots of time for long talks with my friends. Last year, an old friend asked our group to think about what our “dream job” would be. 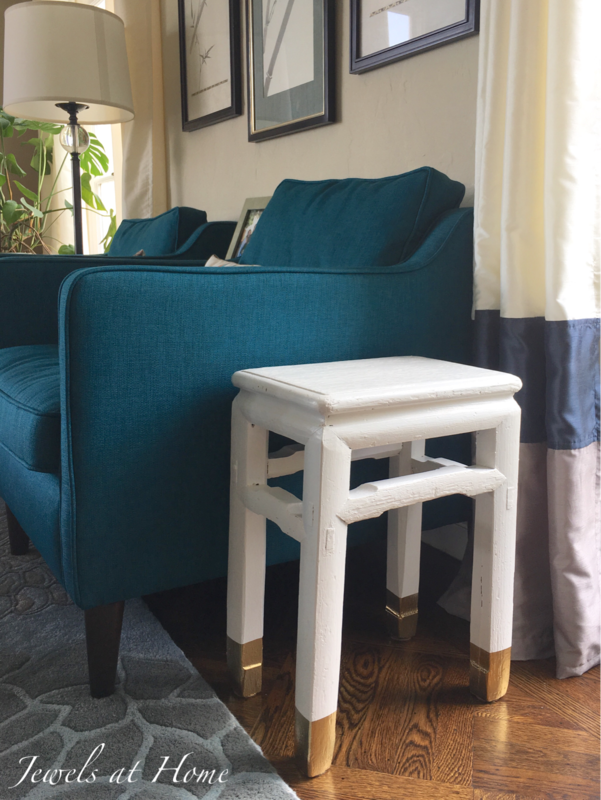 I already have my dream job, but I took the opportunity to reflect on what an alternate or next career could be… something I love doing, but which is not so practical… the easy answer was that I’d love to refinish old furniture with fresh looks. It makes me so happy when I can take a piece of furniture with great classic style but a little (or a lot of) wear and turn it into something beautiful and full of personality. I’ll list some of my favorite past projects at the bottom of this post. Now on to today’s post… It has been a while since I picked this little end table up off the side of the road. My oldest was with me and remarked, “There’s mom being mom” in the affectionate way you talk about a lovable, quirky relative. While I loved the Chinese/ Chinoiserie style of this little table, I was a bit intimidated by its poor condition. You can’t really appreciate in the picture how water-damaged, chipped, and uneven the wood was. Still, it was sturdy enough, and with my newfound love of gardening and greenery, I thought it would make a great plant stand. 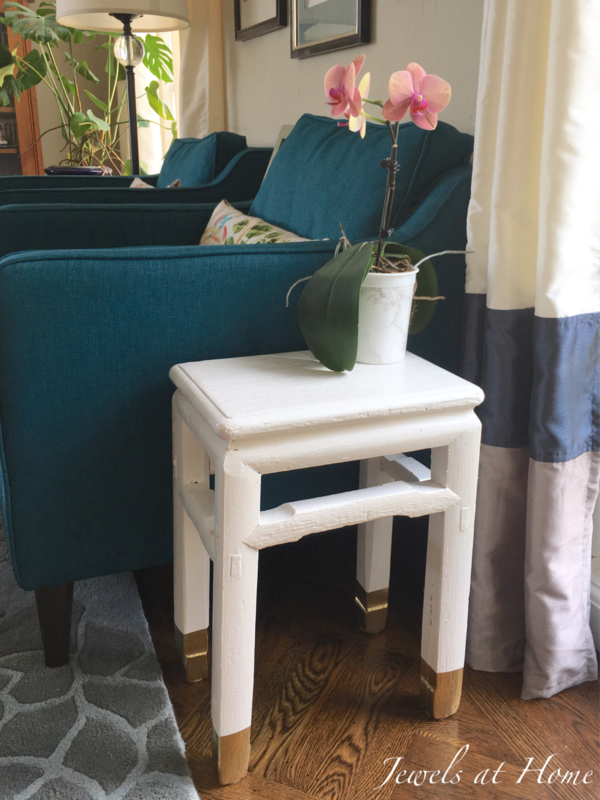 I sanded the table aggressively, used wood glue on one of the legs that was cracked, and then painted it with three coats of white latex enamel (leftover from the interior trim of our house). I didn’t even try to fully even out and fix the surface, letting a lot of the dents and scratches show and add character. 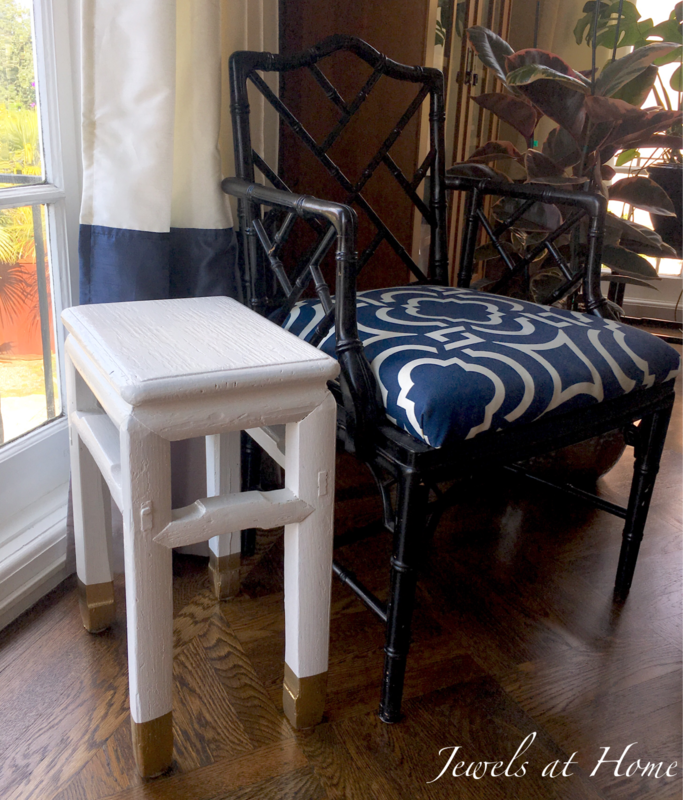 The white paint did a good job brightening up the table and made it look more finished, but it was kind of plain… time for a touch of gold spray paint to cap the legs, and I love the finished product! Here is my new old table in our living room. I think I’ll probably move it up to my bedroom later, but I’m still experimenting with how to use this handsome accent piece! Wow, that was a longer list than I expected. I guess I have a good start on that next career, when I’m ready! Happy furniture hunting and painting!